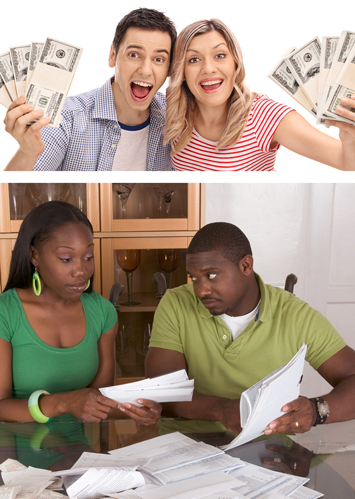 A Never Ending Wealth Gap Between Blacks And Whites In America? Echoing past dire economic reports, a new study looks at the country’s racial wealth gap and its bone chilling ramifications. While other studies brought a heightened awareness of income inequality, wealth inequality offers a clearer picture and the outlook for Black America’s future looks darker unless there is serious change. 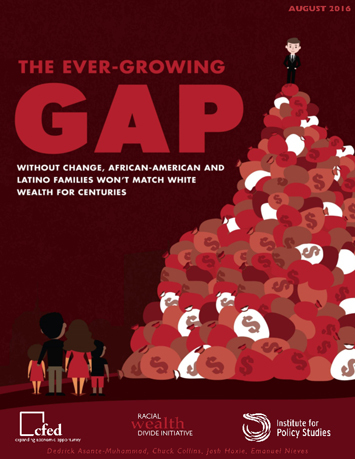 The study, “The Ever-Growing Gap: Without Change, African-American and Latino Families Won’t Match White Wealth for Centuries,” found if nothing changes, it will take 228 years for Black families to accumulate the same amount of wealth that White families have today. For the average Latino family, it will take 84 years. It also notes that without significant policy interventions or an enormous change in the American economy, people of color will never close the gap. The study was published by the Institute for Policy Studies and the Corporation for Economic Development. Wealth or net worth is defined as the value of assets including your home, retirement savings and income minus the debt owed against those things. America likes to characterize herself worldwide as a healthy, fair, and equitable society. The reality is such a society cannot exist if the wealth gap is not closed, the study points out. The likelihood of such a dramatic change in the future is poor. 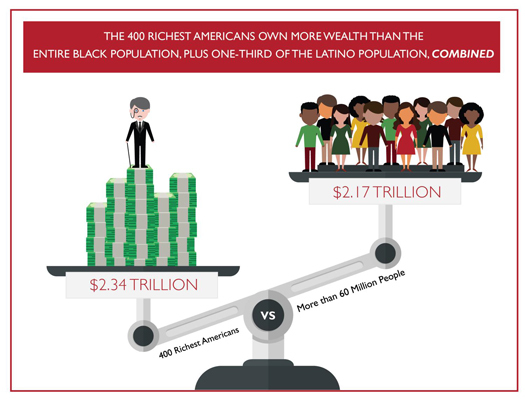 To put it in perspective, the study notes the 400 richest Americans own more wealth than the entire Black population—plus one-third of the Latino population combined. “Over the past 30 years, the average wealth of White families has grown by 84 percent—1.2 times the rate of growth for the Latino population and three times the rate of growth for the Black population. If the past 30 years were to repeat, the next three decades would see the average wealth of White households increase by over $18,000 per year, while Latino and Black households would see their respective wealth increase by about $2,250 and $750 per year,” said the report. “By 2043—the year in which it is projected that people of color will make up a majority of the U.S. population— the wealth divide between White families and Latino and Black families will have doubled, on average, from about $500,000 in 2013 to over $1 million. If average Black family wealth continues to grow at the same pace it has over the past three decades, it would take Black families 228 years to amass the same amount of wealth White families have today. That’s just 17 years shorter than the 245-year span of slavery in this country. For the average Latino family, it would take 84 years to amass the same amount of wealth White families have today—that’s the year 2097,” the report continued. “The racial wealth gap continues to grow not only because of income inequality—Whites have more dollars to sock away—but because accumulated wealth is a mechanism for transmitting economic success from generation to generation. It’s a vicious cycle—poor communities have limited tax bases to fund their public-school systems, which lead to sharp disparities in educational quality,” the study said. That leads to unemployment, high crime, incarceration, and the downward economic beat goes on. The study illustrates government duplicity in this perverse, vicious cycle: “This growing wealth divide is no accident. Rather, it is the natural result of public policies past and present that have either been purposefully or thoughtlessly designed to widen the economic chasm between White households and households of color and between the wealthy and everyone else. In the absence of significant reforms, the racial wealth divide—and overall wealth inequality—are on track to become even wider in the future,” researchers noted. “For Black families and other families of color, studying and working hard is not associated with the same levels of wealth amassed among Whites. Black families whose heads graduated from college have about 33 percent less wealth than White families whose heads dropped out of high school,” said economist Darrick Hamilton, who holds a Ph.D. He is head of the National Economic Association, which is composed of Black economic experts. His group and the American Society of Hispanic Economists recently gathered together for a summer conference in Washington, D.C.
Just seeing a college education as the “great equalizer” and the primary vehicle for economic mobility is unrealistic when it comes to Black-White disparity, he said. According to Dr. Hamilton, in reality, a college degree does little to undo the massive difference in wealth across racial lines. “Economists estimate that, by far, the largest factors explaining these differences are gifts and inheritances from older generations: a down payment on a first home, a debt-free college education, or a bequest from a parent,” he said. Where do we begin to address the economic disparities faced by Black people? One answer might be found in the solution given by Marc Morial, president of the National Urban League, during a recent national convention. “There is a state of emergency in our urban cities. If you look at what they are facing, the deaths of unarmed men, job challenges that we face, there is a sense of urgency,” he said. “As for funding for these initiatives our main stream Marshall Plan calls for the federal government to make a trillion dollar commitment over the next five years. We are not to be hesitant to say that this should be a federal priority and the federal government should fund our cities. We have to renew our efforts. We have called on this plan for years and we will not give up,” he told The Final Call. A plan has also been laid out by the Black Lives Matter movement to tackle this economic issue in a recent manifesto calling for sweeping policy change, including payment of reparations, investing in Black communities and economic justice. “Reparations for the systemic denial of access to high quality educational opportunities in the form of full and free access for all Black people (including undocumented and currently and formerly incarcerated people) to lifetime education including: free access and open admissions to public community colleges and universities, technical education (technology, trade and agricultural), educational support programs, retroactive forgiveness of student loans, and support for lifetime learning programs,” said activists. Economist Dr. Boyce Watkins, in an interview with The Final Call, said the gap can only be closed through an incredible combination of vision and hard work. “The disparity has been in existence for a long time and what a lot of people don’t know is that the wealth gap is growing. Government polices tend to favor the rich which translates to White people. We really need to embrace financial literacy as a people. We need to have conversations with our politicians about the wealth gap,” he said. “From a policy standpoint there is the Urban League’s Marshall Plan and others have been calling for reparations. Individually three things need to take place, stock market participation, real estate ownership and entrepreneurship,” Dr. Watkins said. “As you look around the Black community you don’t see Black business. We have literally been trained to work for somebody else. One of the main principles I teach is every Black family should have a business,” he said. “Unfortunately there is a segment of our population who will get it but the vast majority will continue to wait on a White Jesus to save them or whatever White man-women gets elected president. Our government is not built to close racial gaps and it is doubtful White America will gain this enormous sensitivity to the issues that affect Black America. Personally I am not waiting for that day to happen,” Dr. Watkins said. The report itself calls for a number of policies to address the issue including a government audit, fixing the tax code and the establishment of children’s saving accounts. One thing is for sure is this issue is very serious and needs to be seen as such. Its ramifications will negatively affect the overall economic well-being of the country as a whole. “It is clear from the past three decades that our vision for racial equity will be impossible to achieve if we continue perpetuating an economic system that fails to prioritize the ability of households of color to get by, much less ahead,” the report concludes.